Jessica Brillhart is an American film director who is widely known for her pioneering work in virtual reality. An alumna of New York University’s Tisch School of the Arts and the Courant Institute of Mathematical Sciences, she joined Google in 2009 as their first filmmaker. She spearheaded numerous award-winning shorts and documentaries as part of their Creative Lab before joining the Google VR team in 2015. Brillhart worked with a team of engineers to help develop and field test the 16-camera live-action virtual reality rig and workflow now known as Google Jump. The resulting film, World Tour, was the first virtual reality experience made with the Jump ecosystem. Brillhart went on to create a number of critically acclaimed experiences that span genres from sports documentary (Go Habs Go! ), to music video (Resonance), to experiments in machine learning and AI (DeepDream VR). 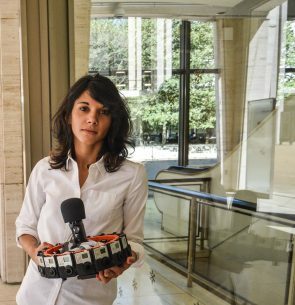 Her work also dives into a a number of important medium and media-related issues, such as disability (Beethoven’s Fifth), cultural representation (Navajo Nation), and access (Conditions at Omaha: The Weather Channel in VR). Her work has been showcased at galleries, conferences, and festivals globally. Brillhart is also a virtual reality theorist, writer and mentor. She’s a contributor to Filmmaker Magazine. Her medium publication, The Language of VR, has been used by universities, various other education programs, and creators from all over the world. She’s taken the stage at Google IO, Oculus Connect, and The New Yorker TechFest; has worked as an advisor for Sundance New Frontiers and IFP; and has been a judge for ADC Young Guns, SXSW, World Press Photo, and the Tribeca Film Festival. She has been lauded as a pioneer in her field by MIT Technology Reviewand been profiled by Glamour Magazine, MovieMaker, Filmmaker Magazine, Futurism, Bauhaus 100, Suddeutsche Zeitung, and Killscreen, among others. Brillhart currently resides in New York with her German shepherd, who has agreed to accept virtual reality as part of his life so as long as he is still fed, scratched, and walked.